Peeping Tom is a person who, in the legend of Lady Godiva, watched her during her ride and was struck blind or dead. 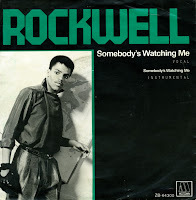 The song 'Peeping Tom' was Rockwell's third single, taken from his album 'Captured'. It also featured on the soundtrack of the motion picture 'The last dragon', a Motown Productions picture. This martial arts film was a critical disappointment but a commercial success. Although personally I think this is an accomplished song, it was not successful in any territory. I had the 12" single before I found this 7" single - and I do admit the remix is better than the single version. 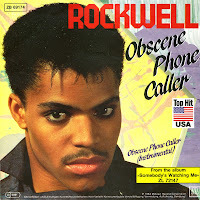 'Obscene phone caller' was Rockwell's second single and an attempt to follow up the highly successful debut 'Somebody's watching me' with an equally successful song. Where 'Somebody's watching me' could be construed as a song about voyeurs, this time around Rockwell sang about a heavy breather on the phone. The audiences were not impressed. In the USA, where according to this sleeve the single was a 'Top hit', it peaked at number 35. In German, where this single was made, it only made number 53 and in the UK it stalled at number 79. It soon became obvious that Rockwell had gained a status as a one hit wonder. Rockwell is the son of Motown CEO Berry Gordy, Jr., Kennedy Gordy. He had himself signed to Motown without his father's knowledge. Dad did not find out until 'Somebody's watching me' and the accompanying debut album were released on his own Motown label. Backing vocals on 'Somebody's watching me' were provided by Michael Jackson, who was not credited on the single for this. It may have contributed to the big success of the single, which peaked at number 6 in the UK and number 2 in the Netherlands. Rockwell is the son of Motown founder and CEO Berry Gordy. To avoid charges of nepotism, Rockwell secured his record deal without his father's knowledge. 'Peeping Tom' was Rockwell's third single, taken from the motion picture 'The last dragon'. When I heard the 12" remix of this track, thanks to my sister who had bought the 12" single, I was really impressed. I liked the echoed vocals, the extra beats, the instrumental breaks and everything that the single version lacked. I only got the chance to buy this record three years after it was released - but I still remembered it. Good remixes can do that.